I headed east into Arizona and made stops in Phoenix and Tucson to visit friends and family. Then I spent a couple of days at my parents’ place in Mescal with a trip to Tombstone, one of my late dad’s favorite places. Then I headed for New Mexico and its cool, towering pines. Unfortunately, health issues forced my daughter Summer and son-in-law Evan to cancel their trip, so it was my cousins and me with two 50-inch UTVs. Using Forest Service maps, we set out in the Can-Am and Polaris to find the gnarliest trails in an area none of us had been before. Neither machine had GPS, and cell service was spotty, so we had to rely strictly on maps. Once deep in the forest, it was hard to tell which way was north, and I silently cursed myself for not bringing a hand-held GPS unit. We managed to find some very challenging trails worthy of the two adventure machines. While it didn’t quite have the granite Volkswagen Beetle-sized boulders found at Johnson Valley’s King of the Hammers, one solid-rock trail reminded me of the worst paving job in history, and the trail’s direction wasn’t jiving with the maps. As the pounding got worse and the hills got steeper, we went to low range on both trail machines and pressed onward, testing suspension, four-wheel drive and cabin comfort. Worse still, the sky was getting darker and darker with thunder clouds. The increasingly tougher terrain would have been more enjoyable if it weren’t for all of the fence lines and gates we had to open and close. As average speeds dropped to a drunken snail’s pace, the skies got more threatening, now with the occasional lightning flash. Being in the trees during a lightning storm is bad enough, but we were also climbing a ridge. We got to a trail junction, and the map said we should go left, but Matt thought we should go right. With the maps thus far being about as accurate as the polls leading up to the 2016 presidential elections, I decided to follow Matt’s advice. The thing was, we were heading directly towards the darkest part of the ominous sky, so I pinned it, and Matt and Jenny would catch up at each gate. And then we hit the County Road, exactly where the maps said it would be. We made it back to the cabin and high-fived a successful ride. On the way into town for dinner, we finally met the storm. It was more like a deluge, complete with hail and plenty of lightning. Rain running off of the Mexican food restaurant’s roof looked like Niagara Falls, and we were hoping the storm hit the trails we had ridden. We did the same route in the opposite direction the next day and had a blast, although the storm hadn’t perfected the loamy forest soil. Too soon did the mini vacation end and I had to head home. Before the California border and Blythe, I always top off with cheaper Arizona diesel. I wheeled into the Chevron and to an empty pump. Lo and behold, Shane was pumping diesel into a brand-new F350 dually! Jack and Shane had flown to Texas to buy Jack’s new 6×6, and I hadn’t talked to them in a week. What are the odds of us traveling 1000-plus miles and ending up at the same spot at the same time? We bought some sandwiches and drinks and went to find this mystery beach on the Colorado River. We unloaded the UTVs and hit the hot, white sand. On our second trail choice, we found the spot we were looking for. 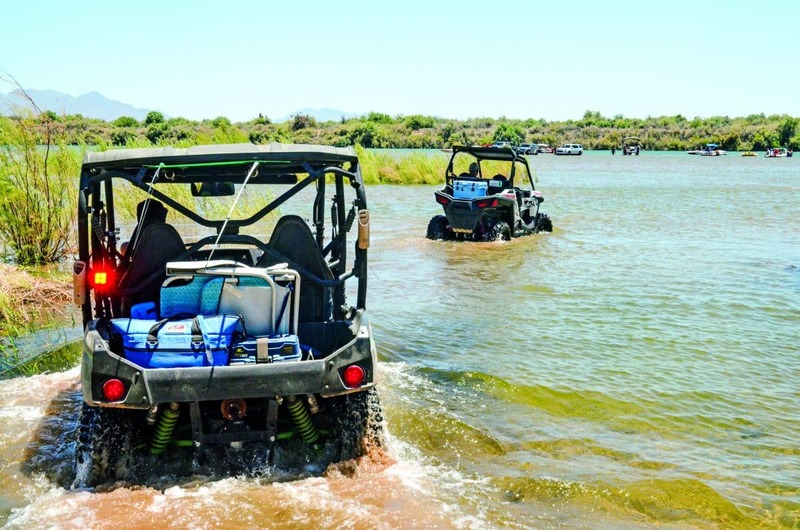 We followed a family in a Teryx into the river and onto a huge sand bar, where several 4x4s and boats were parked, beating the heat. We ate our lunch and were truly “rollin’ on the river” at Hidden Beach. It was a perfect end to a great adventure through water deep enough to flood the floorboards, but neither UTV got water in the CVT.